When a client comes to you in emotional distress and you sense that childhood wounds are the cause, your instinct is to spring into action. I’ve spent my career working as a marriage and Family therapist in Santa Monica so I understand this instinct. We want to stitch them up and slap on a new metaphorical bandage. They need a therapist who listens. We think, understandably, that because of years of education and training, we can fix them. We can’t. At least not yet. If something happened to your client as a child, and they’ve been carrying the experience around silently for decades, the act of putting voice to their story and having someone listen and really, truly hear them, can feel groundbreaking to them. In the beginning of your journey with them into their past, that’s all they need from you. Your client doesn’t want to feel like they are one of many with similar stories, and when you rush in with solutions, they may feel ashamed they couldn’t solve it themselves. Instead, when you sit with your client in silence and hear them tell their story—in their way, at their pace—you are able to offer them the validation they have wanted their whole life and haven’t received. Your client needs to know that their experience is as unique and as important to you as it is to them. Being heard brings the realization that we are not alone, that people care about our feelings. As a family therapist, I’ve seen how important silent listening is. 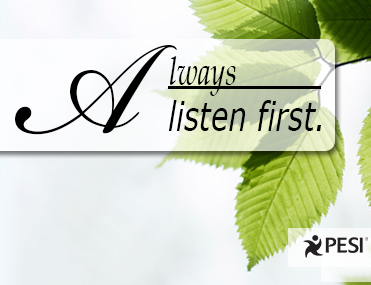 When you listen, you let your client know that they are not alone and never have to suffer in silence again. The end goal is to heal the wounds, but the first step is to just let the wound breath.